One of our goals for Vector Hack was to facilitate collaborations between our international participants and local artists working in various ways with sound and image. In particular, we were very pleased to invite members of the Slovene experimental electronic group Kikimore (Barbara Poček, Sara Mlakar, Nina Orlić, and Staša Guček) and croatian artist Vanda Kreutz to seek new configurations with the other artists in the festival. The Saturday and Sunday evening programs in Ljubljana will provide a showcase for these spontaneous meetings of audiovisual explorations. 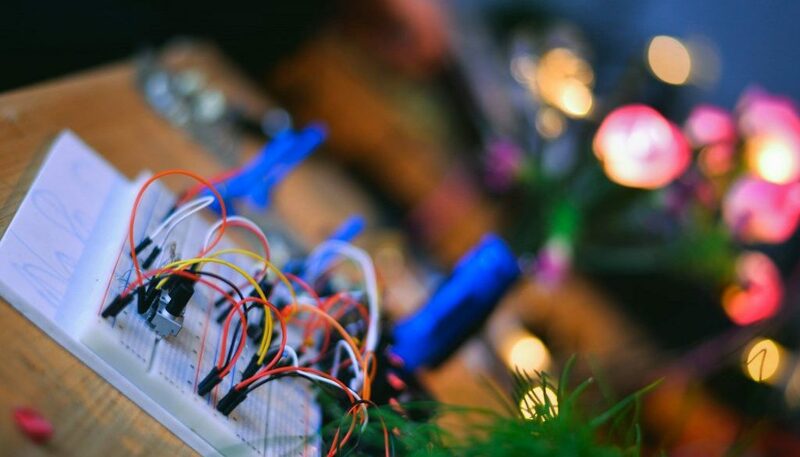 Kikimore is a group of six girls sharing an enthusiasm for musical improvisation and soldering analogue instruments. They began meeting at workshops within the ČIPke initiative at Rampa Lab (Kersnikova Institute) in Ljubljana, which explores the position of women within the context of science, technology and intermedia art. Their name comes from Eastern Slavic mythology. The kikimora is a mythical creature, a female spirit that resides in houses and causes unusual noises during the night. Improvisation within a broadly specified structure, various combinations of sounds, sound manipulation, and the resultant rhythm – these are the foundations on which Kikimore try to build their own noisy musical expression.